Can see you don't live in England, we call them winterhedges. Watch out for black mould. be because I need to tackle my own laundry today. Anon@10:50, I smelled clean wet laundry too. I'm wondering if my husband should do this. We recently bought our home (after renting for almost 19 years) and I really want a clothesline. Husband doesn't really want to put concrete in the ground for a line. We can't attach a line to the tree like at the old place. Husband wants to put a anchor in the brick of the house which I think is not wise. Perhaps husband would consider this, even if it was put on the patio. Ultimately, husband will make the final decision. It's good to share ideas in case he had not considered something as this. I just put up a single line retractable in the back yard this week, and I put the anchor hook in the mortar of our brick house. Of course, it's only been a few days, but I've had several loads out there- one day it was very windy (it's Oklahoma! ), and no problems. In the winter I only wash one load at a time on any given day. Since there are only 2 of us, it is not a problem. 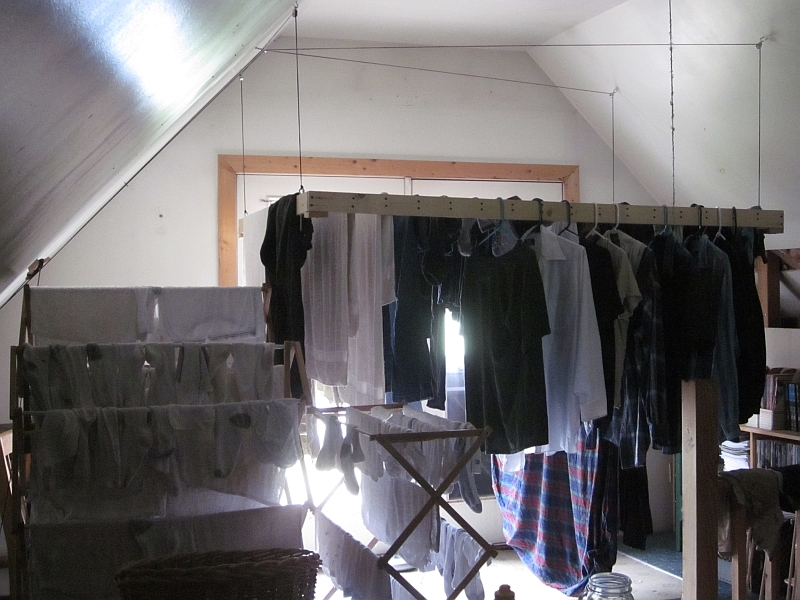 We don't use our living room in the winter so have a reel clothes line that we use for sheets so we can hang them without folding them. Everything gets hung outside in summer because, well just because. I dried all the this week's laundry without the dryer. 5-6 small to average loads. I did fluff the towels and the husband's work clothes for 5 minutes before hanging. I have two small folding racks and two retractable clotheslines in the basement, as well as a rod. Cluttered, but it worked. I have an umbrella line for outside but its so close to the trees that I have bird issues. I'm hoping to come up with a solution for the deck or entryway overhang. However, I never hang sheets that I have to use outside -- allergies! I imagine that helps with the dry-ness caused by heating with wood too, they probly dry quickly in the winter! in the hall way.I also had a small drying rack for the rest of the laundry. we had an outdoor clothesline that fell...but i had husband replace it with steel poles, concrete and plastic coated wire as well as twice as many lines and line ratchets...what does not fit the clothesline goes on a drying rack . if damp or foul weather mess up the day of clothes on the line then i make use of the back porch as well as the drying racks. push come to shove, if needed i can place a large drying rack in front of the fireplace and turn on the ceiling fan for air circulation...dry in no time! Growing up I lived at home for 21 years and we never had dryer. I don't even think I ever saw one until I was 18 and that was at a laundrymat. We hung the sheets out on the line winter or summer rain or shine. 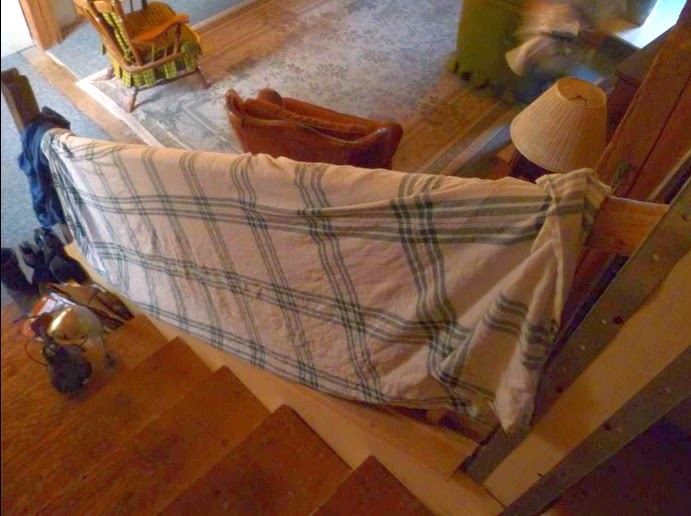 In the winter after being out all day we would bring in the laundry and stand it in the corner until it thawed. It would be damp but not wet and we would drape it over the table and chairs overnight. We had wood heat and that meant no heat at night. Somehow the little dampness that was left after drying and freezing on the line was gone by morning. I didn't know there was another way for the first 21 years of my life. I've done this clothes line in many places, indoors and out. Maybe one of your readers would find it useful. Reminded me of years past when we would hang our laundry out to dry in the winter and bring it in frozen and then put it on racks on top of the heater grates! Nothing funnier than standing your Levis up in a corner while you hang the rest! We used to call them 'freeze-dried'! When we built our house we included a deck for our washing line. This deck is off the basement part of our house and under a deck that is off the upstairs part of the house. My husband hung parallel lines supported by timber struts attached to the bottom of the upstairs deck. There are 6 lines about 4 metres long. I can easily hang up sheets and blankets on the lines. I bought a drier 27 years ago when our third child was born but have hardly ever used it. 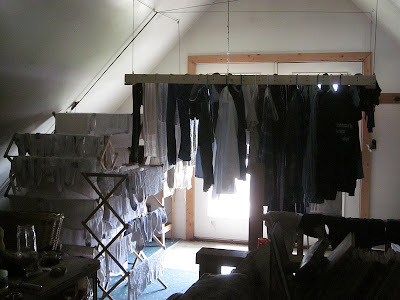 I used cloth diapers for all three children and dried all the diapers on the clothesline. Sunshine is the best disinfectant. I remember the "free-dried " Levi's as well. One question ... how do you solve the moisture problem created by your upstairs drying rack ? Open windows ? Dehumidifier ? fan-vent ? I am surprised that you would not have an impending mold issue on the drywall and other wooden components otherwise. We don't have a lot of humidity here so moisture build-up hasn't been a problem thus far. We do have a ceiling fan but seldom use it (except in summer). We also have deck doors behind the drying rack leading to a tiny unsafe balcony (never used) but the doors are not open in winter. But as I said, we just don't seem to have moisture issues. Patrice / Ruth .... I never thought of that ! Makes perfect sense ... wood heat ! Even tho we live in SW FL there are many days I cannot dry laundry outside and due to HOA rules cannot have laundry lines. I dry everything on drying racks. There is only my husband and I so one set of king sized sheets. I use 2 racks folding the sheets in half and turning them once. Indoors I will run the ceiling fan for about 3 hours. Sheets and extra large bath towels always dry overnight. Just takes some getting used to. Do you iron all that? so her things dry fairly quick. Heavy old fashioned metal poles work the best. Only place I found mine was watching for older houses to go up for sale. Ask owner if I could buy the clothesline poles and they were happy to see them used, so I was gifted them. Also didn't want to pour concrete so I dug about two feet down, put in pic pipe vertically (just slightly larger than clothesline pole) then filled in wih dirt, packed tightly and watered and packed again. Slid poles into pic pipes. Twenty years later still working fine. If I ever leave, I'll take them with me or gift to someone else. E advantage over wood poles is the permanence. Forgot to mention that I grew up in the winter snow, and my mother and grandmother hung up the laundry outside in the winter unles it rained or snowed, then the laundry was hung in the basement similar to your setup, although hooks were junk screwed into rafters. I bought a three armed pole and place it over the heater vent with a fan underneath to blow air. Works. I rent a small house right now with access to a washer & dryer. There's a clothesline on the property, so I use the washer and then hang all my wet clothes on the line to dry. There's some sort of simple satisfaction in hanging laundry out to dry and it also saves on the gas bill. Dryers also wear out clothing more quickly (dryer lint). 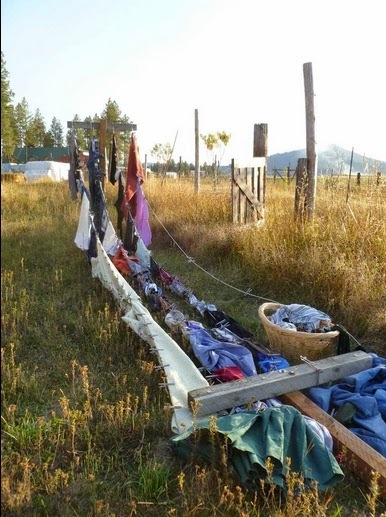 I live in New Mexico, and those of use in dry, mild climates know that clothes out on a line will dry within several hours, year round. 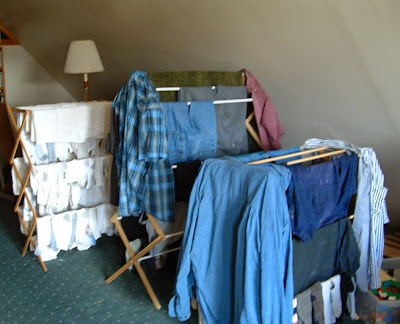 When I lived in the tropics with no clothes dryer I put the wet laundry on a wooden drying rack and then set it in the middle of the living room under the ceiling fan. Back home now and with a wood heater in the basement. There is a large floor grate set above the wood heater. With all that heat drifting up - I've set a large wooden drying rack right on the grate. Doesn't take long to dry laundry or wet outdoor gear. Summer time I do use an outdoor clothes line.